Win In This Corner Of The World: A beautiful animated portrait | SWITCH. 'In This Corner of the World' tells a heart-warming and inspirational tale of the everyday challenges faced by Japanese people in spite of a violent, war-torn climate. The award-winning story follows a young girl named Suzu Urano, who in 1944 moves to the small town of Kure in Hiroshima where she marries Shusaku Hojo - a young clerk who works at the local naval base. Living with his family, Suzu becomes essential to the running of the household and creatively prepares meals during the tough wartime conditions while also carrying out daily housework. Click here to read our theatrical review of 'In This Corner of the World'. The 'In This Corner Of The World' competition has now closed. Winners will be announced shortly. Competition opens at 5pm AEST on Sunday 1st April 2018 and closes at 11:59pm AEST on Sunday 8th April 2018. Five winners will be chosen at random on Monday 9th April 2018. To successfully win, entrants must fulfil the above entry conditions before the time the competition closes. Current members/followers are eligible to enter the competition. Only one entry per person. Only one winner per household. To be a valid winner, the entrant must not have won a prize from SWITCH within the last 28 days. 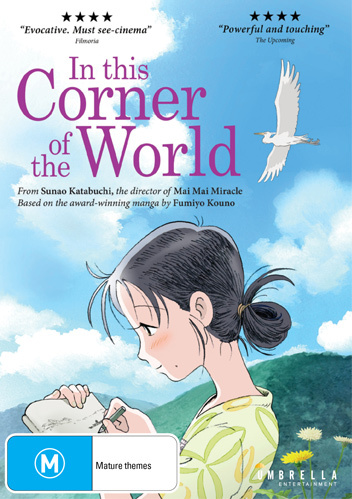 Each winner will receive one DVD copy of 'In This Corner Of The World'. By entering, you agree to receive occasional emails from SWITCH in the future. If you decide to unsubscribe from these updates, any further entries will not be applicable. Only Australian residents are eligible to enter. 'In This Corner Of The World' is available on Digital and DVD on Wednesday the 4th April 2018 from Umbrella Entertainment. Discover more about this and all of their titles at www.umbrellaent.com.au.